“Imagination is more important than knowledge. For knowledge is limited to all we now know and understand, while imagination embraces the entire world, and all there ever will be to know and understand.” said Albert Einstein. I whole heartedly agree. I believe it is extremely important, especially in children to nurture imagination and make it grow. Most children are imaginative. But formal schooling which lays emphasis on scoring marks by giving exact answers (especially in many of the Indian schools) mostly kills imagination. Anti-colouring books (By Susan Striker) are a good exercise to develop critical thinking skills and to nurture imagination in Children. My two children (son who is 13 and daughter who is 9) absolutely love them. I too do these exercises with them and I, despite being an adult, thoroughly enjoy it. We treat this time with reverence--it is a 'special activity with mummy' time. If they have fought with each other or disobeyed me,then I don't do it that day. (The point I am trying to make is that they truly treasure the time I spend doing stuff like this with them). Here are a few pages of what we did. 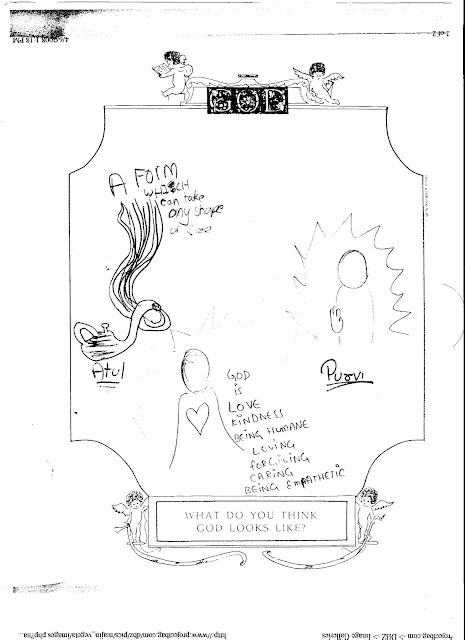 On each page we took a small part of the picture, to do the exercise and then passed the sheets around so each one got to do each exercise. Click each image to see the enlarged view. 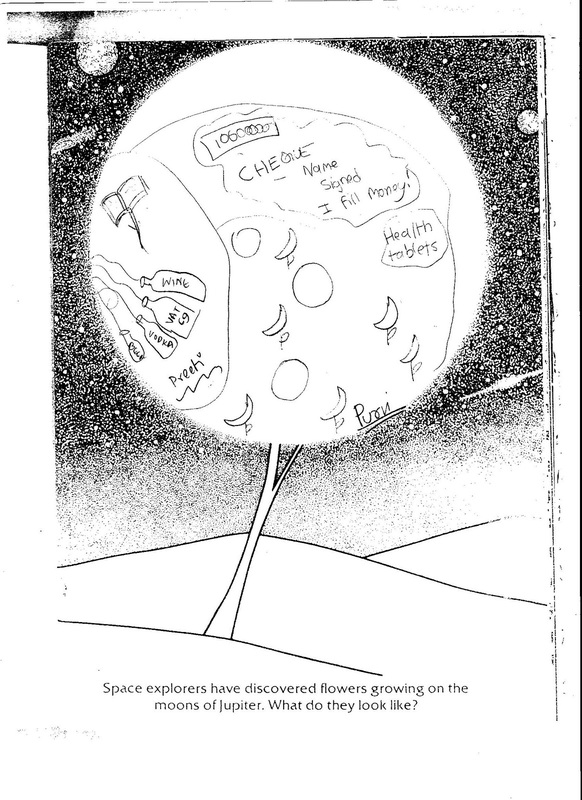 'Space explorers have discovered flowers growing on the moons of Jupiter. What do they look like?' asks the question. 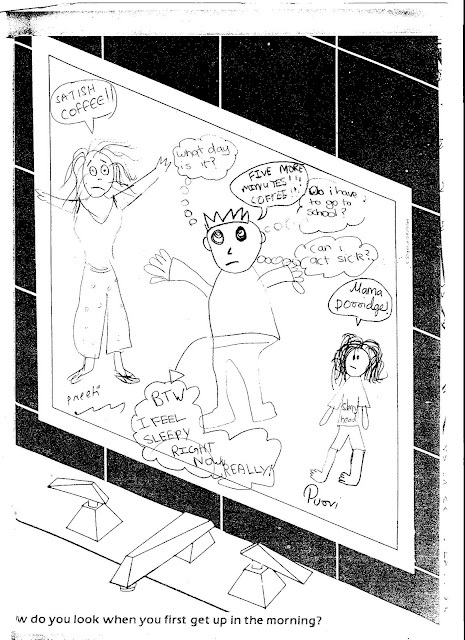 You can see what I drew :P :) and also what my children drew. How do you look when you first get up in the morning? 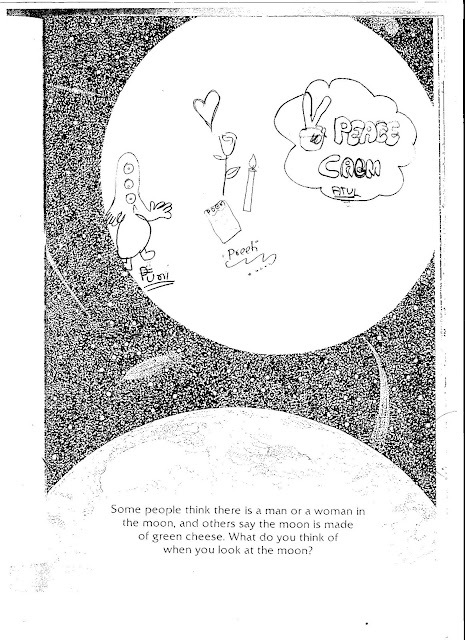 Some people think there is a man or a woman in the moon and others say the moon is made of green cheese. What do you think of when you look at the moon? I loved what my daughter drew for this one. (she has drawn an alien). I liked my son's drawing too. If any of you want to do this activity (whether or not you have children, trust me it's a great creative thinking exercise) , do post it on your blogs (if you have one) with a link back to this post and I would surely have a look! My other favorite is Purvi wishing for never ending wishes ! Clever that girl ! Wow, that's an expressive activity and doubles as a bonding time too. even i have this 'play time with mummy' along with my 14 and 12 year old.Among other games, we play a word game in which you have to arrive at the word through clues. This is a good game to activate your thinking skills and a vocab enhancer too. I'm definitely doing this one. Fun! Man those rules are profound! Please archive these parenting posts coz I will be using them when the baby grows up (which will be very soon :))! The printable pages are amazing! It is wonderful to see the different kinds of activities you do with Atul and Purvi. How you come across these resources?? This one is truly an eye-opener. Brilliant post, Preeti! This post is excellent. I have already gone through Susan's website and even shown it to my 7 years old daughter. i feel like searchng all my drawing sheets on which i made such drawings :) :P longgg ago !! and purvis alien is cute too !! Sushobhan :Thank you. I agree. Shobha: Do try it. You can print out some of the activities. They're indeed great. 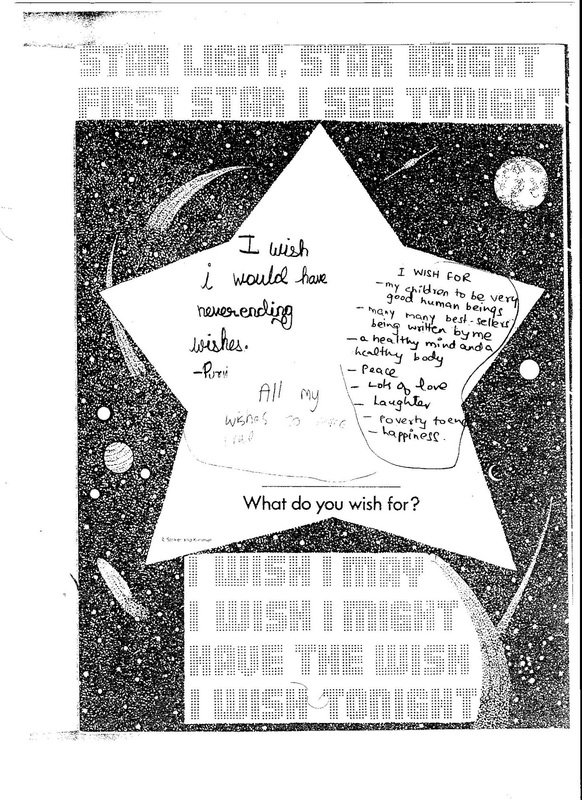 Aathira: I read LOTS plus have worked with children for nearly 8 years. Used to run my own workshops for kids on developing thinking skills. Shachi: Thank you. Just click on the label 'parenting' on the right and you will get all the parenting posts. Suchta: oh yes--lots of fun. Asha: Yes--your word game sounds good! Ruch:Thanks! Yes--so much better than colouring books. Creative yaa...awesome. The site is pretty useful. I have written the review.